You are here: Home / Healthcare professionals / Interaction is Intervention, but how do we foster it? Interaction is Intervention, but how do we foster it? Musculoskeletal physiotherapy, including sports physiotherapy, involves both “specific” and “non-specific” effects. Specific effects are related to the specific intervention provided (e.g. improvements in strength after an exercise programme). “Non-specific” effects are related to other variables associated with the patient, therapist and setting which may influence clinical outcomes like pain. Recent quantitative research has shown that “non-specific” factors including a positive patient-therapist interaction can enhance treatment outcomes. This means that patients who reported getting on well with their clinician had better outcomes. 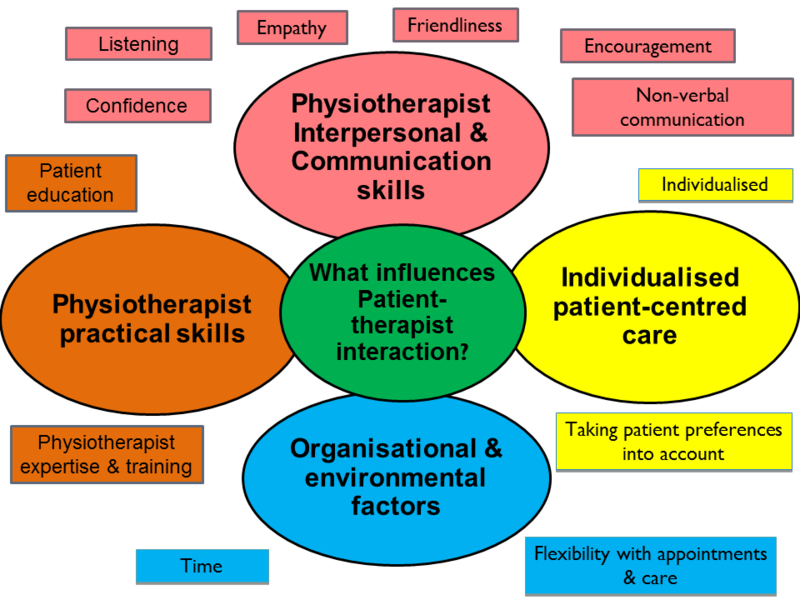 A recent review by the Pain-Ed team examined what are the characteristics of a good patient-therapist interaction when patients attend for musculoskeletal physiotherapists. 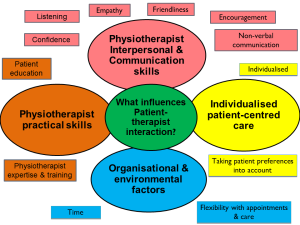 This qualitative meta-synthesis looked at 13 studies in which physiotherapists and/or patients were interviewed through focus groups or semi-structured interviews on their perceptions of factors which influence the patient-therapist interaction. 1) Physiotherapist interpersonal and communication skills: the presence of skills such as active listening, encouragement, confidence, being empathetic, friendly, humorous and having good non-verbal communication skills facilitated a good interaction. An unfriendly physiotherapist, or one that interrupted the patient frequently, was seen as a barrier to a good interaction. 2) Physiotherapist practical skills: physiotherapist expertise, level of training and ability to provide clear, easy to understand education were seen as facilitators. Lack of education or education given in technical terms was seen as a barrier to a good interaction. 3) Individualised patient-centred care: individualising and modifying the treatment to the patient and taking patient opinions into account facilitated a good interaction. 4) Organisational and environmental factors: giving patients enough time and being flexible with the timing of appointments was seen as a facilitator of good interaction. Feeling rushed or not getting enough time with the physiotherapist was seen as a barrier to interaction. Personal info: Mary O’Keeffe (@MaryOKeeffe1990) is just about to complete the fourth (and final) year of her PhD at the University of Limerick (UL), Ireland. Mary’s PhD research is examining whether tailoring multidimensional rehabilitation to the individual chronic LBP patient enhances effectiveness, and is worth the additional time (and effort!) involved. Her supervisors are Dr Kieran O’Sullivan and Dr Norelee Kennedy from UL and Prof Peter O’Sullivan from Curtin University, Perth. Mary’s PhD research is funded by the Irish Research Council.